We ventured to Costco today to do some shopping. As always, Costco was very busy. It was hard to maneuver down the isles. So, Jonathan would wait as I went down each isle to get what I needed. Haylee would stay with me for the most part but started to wander and I would have to keep calling her back. There was a man that was behind me. He seemed to go where I would go. After getting the bread I needed, I went to put it in the cart but could not find Haylee. I looked over to where I was at and for some reason she thought the man that was behind me was Jonathan and jumped on his cart as he was pushing it away. He looked down at her very puzzled and stopped. I called her name and she just froze. She just sat staring at the man like " what are you doing and where is my dad?" Than Jonathan called for her also.... She realized her mistake but was so embarrassed that she would not move. I sent Devin to get her and she just broke down and started to cry. It was quite funny but I did not dare laugh. Maybe this is a good lesson on staying with mom when we go to the grocery store.. 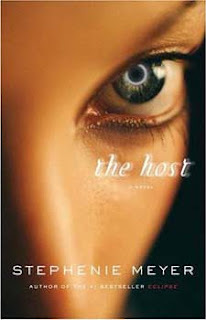 The latest book from Stephenie Meyer is called "The Host." Aubrey and I went in halfsies and bought it last week. Well, for a week straight I haven't been able to put it down. This is one of the reasons you have not seen a new blog from me in that amount of time. Well, I finished it on Tuesday. It was really good. There was actually a part in it that got so intense that I put the book down and would not pick it up again for 2 days for fear of what was going to happen. Okay, so I really get involved in the books I read. I am sure my husband is very thankful that I have finished it. I will now get back to my daily routine again. I do have laundry piled up higher than I would like. I should invent something so that you can read and fold laundry at the same time. Maybe there is something already out there that I don't know about yet. But, now I am craving another good book. Any suggestions? I have been thinking alot about my grandma lately. She has been such a great influence in my life. I remember going to her house in Kirtland and playing with the homemade play dough that she always kept around. It had such a distinct smell of salt. Sometimes we ate a little bit of it. My sister Amber always seemed to eat more than she should have. When I married and moved away, we would come visit and stay with her. For breakfast we always had her canned peaches and her bread that was always homemade. She liked to toast the bread, a little dark for my taste but that was the way she liked it. My kids would call her the grandma with the yummy peaches and bread. I went and visited her a few months ago. She played pass the balloons with Haylee and Jerin for an hour. They love her as much as I do. 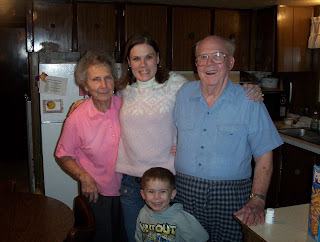 I am so thankful that they are able to have memories of their great grandma. So, I want to pay tribute to her. On June 7th I want to record her thoughts on video. We are having a Dean family get together on that day at Aunt Lori's house at 5:00. If you have any questions or stories you would like to capture on video, email them to Lori so she can give them to grandma ahead of time. It will give her time to think about them. I am so excited to do this. Today Joel would have turned 31. 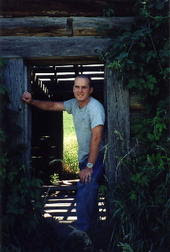 It is hard to believe that he has now been gone from us for almost 5 years. I still think about him all the time. Tonight I am having a party at my house in his honor. Plus, the Jazz are playing and he loved the Jazz. He loved basketball in general. He was so competitive, funny and so much fun to be around. He started losing his hair early. So, he used to shave his head. This is him shaving his head just in the middle. He sort of looks like grandpa Dean. He was always being so silly. You could always count on having such a great time when you were with him. We all know that, especially Kristy and the kids. I know I already posted this video on an earlier blog, but I wanted to do it again. HAPPY BIRTHDAY JOEL!! We love and miss you so much!! About a month ago, I talked to a few people about starting a book club. I love to read and find books that I want to share with others. I am thinking about starting a blog just for this purpose. So, if you would like to be a part of this, the first book is " You can Heal your Life" by Louise Hay. I thought that we could meet once a month and for those of you who can not meet because of distance, you can blog about it, when I set up the book club blog. So, the first book club meeting will be June 28th at 6:00 at my home. That gives us plenty of time to read the book. If you are interested in being part of it, let me know. I am so excited to finally get this started.. I took Aubrey to get her permit today. The laws in Utah are that she has to have her permit for 6 months, have so many driving hours, and take the drivers education course before she can get her actual drivers license. She is totally bummed out by this because she really wanted to be able to drive by her 16th birthday in July. I remember how easy it was to get my license in New Mexico. I turned 16, went down and took the written test, and than the driving test. I purposely went to Bloomfield because the rumor was the test was much easier down there. I was in our brown van and passed with flying colors. Now, that I am an adult and have a teenager that is about to drive, I am glad for all the new laws. Aubrey needs as much practice as she can get..... and so it begins. Like so many other people, I have read the Twilight series. I loved it. I have always loved vampire anything. I am not sure why but I have. So, I got a glimpse at the trailer for the new Twilight movie. I am excited to see the movie but bummed that it doesn't come out until December. The only thing I am disappointed with is that I did not picture Edward looking like that at all. He is so much more handsome in my mind. Ha ha.. Oh! Well. I guess that is why I think reading is so much more enjoyable than watching it on the big screen. On saturday my mom was sealed to her husband in the Jordan River temple. It was a great ceremony and the best part is that all my siblings, except Jared and Lindsey, were there to witness it. It just helps remind me of how much I love my family. I am part of the best family ever.. We than went to a park by Monica's for a barbecue and a wild game of kickball. What a great day! All of the family and some friends at the Jordan River temple. I couldn't of asked for better weather. My handsome husband and myself at the temple. L has some amazing barbecueing skills. Jonathan is looking on ready for a hot dog. the two newest members of the family. Misty is holding Xandri and Amber is holding Zyan. These girls are best of friends and cousins too. Kya, Haylee,and Savannah. So it got a bit cold as the day went on. We are getting warm by the grill. Thanks for the bunny ears Rolland! Devin playing kickball. Run!! Devin Run!!! At the end of the day. 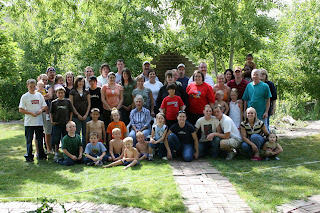 One last family picture.. What a great day. Tonight I was able to accompany Jonathan on his work as State delegate. Is that what you call it, work? Well, we were invited to a dinner by Senator Mark Madsen so that we could hear his views on things. I must say that I was so impressed. It was not just the Senators answers but the way he approached things. The dinner started at 6:30 and he spoke for 3 hours, taking peoples questions about everything under the sun, things that pertained to Utah and things on a national level. It was very engaging.. It has really given me the desire to be much more politically active, to get a better handle on the issues especially at a state level and to even get to know the constitution better.